Kaydon Engineering Corporation was founded in May, 1941, by A. Harold Frauenthal in Muskegon, Michigan. Previously, Frauenthal had worked his way from sales engineer to vice president of Bantam Bearings Corporation, filing many patents along the way. He chose Muskegon for the quality of the available labor and the cooperation of the business community, and named the company after his children, Kay and Don. The location on McCracken Street—still a Kaydon facility—was purchased and adapted for the manufacturing of bearings. At the time, the US Navy, in need of extremely accurate and thin bearings for gun turrets, described Frauenthal as "perhaps the only man in the country who has the experience and ability" to do the job. In spite of wartime shortages of equipment, materials, and labor, Kaydon earned the Army-Navy 'E' for outstanding contributions to war efforts—the highest honor a company could receive. Kaydon survived the war-to-peace transition through increased productivity, sustained effort, and a focus on quality. Leveraging its experience, Kaydon concentrated on specialty bearings not stocked by other manufacturers, supplying the machine tool, automotive, production equipment, construction machinery, and atomic reactor industries. 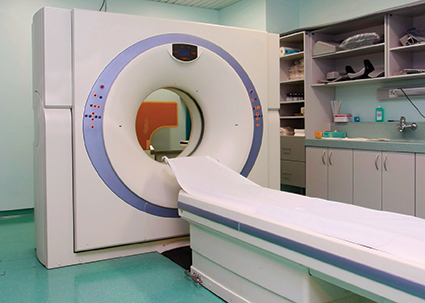 The company went on to invent the Reali-Slim® thin section bearing in the 1950s. Reali-Slim remains the lightest, thinnest bearing in the world, and one of Kaydon's most popular product lines. Kaydon continued to invest, grow, and diversify through the 1960s and '70s, developing bearing solutions for aerospace, aviation, machine tools, and other applications. 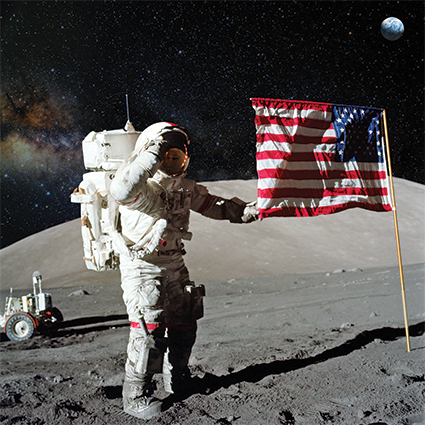 Specialty thin section bearings, designed to withstand the harsh environment of space, made it to the moon on the Apollo spacesuits and lunar rover—further establishing Kaydon's reputation for meeting unique application requirements with innovative, custom designs. 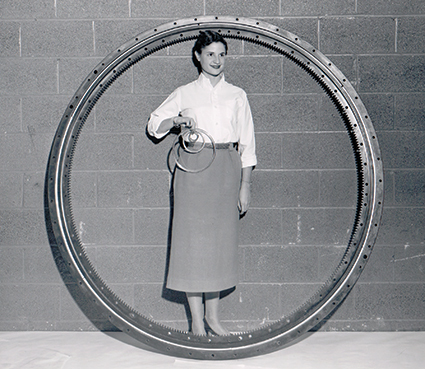 By the 1980s Kaydon was developing thin section and slewing ring bearings for new applications including industrial robotics, CT scanners, space shuttle robot arms, satellite launching systems, and wind turbines. Kaydon opened its first international plant near Monterrey, Mexico, in 1988 to meet growing demand. Custom bearing solutions were designed for high-profile applications including the space shuttle Columbia, the Apache helicopter, and the Bradley Fighting Vehicle. The 1990s saw all Kaydon facilities earn ISO9001 certification; plants that serve the aviation industry also earned AS9100 certification. With the growth of wind energy in the 2000s, Kaydon began producing pitch and yaw slewing bearings of up to 10' for wind turbines, opening a second plant in Mexico and acquiring Avon Bearings to meet demand. The Avon, Ohio, plant also provides Kaydon's popular replacement and remanufacturing services. In 2011 Kaydon opened its first facility outside North America—a plant in China designed to serve the medical equipment market there. The Kaydon Corporation was acquired by SKF, the world's leading bearing manufacturer, in 2013. 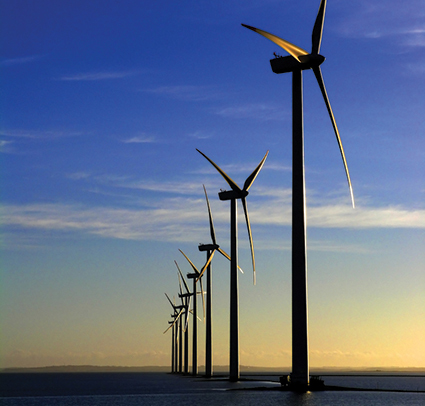 SKF opened a Kaydon Bearings plant on its campus in Cajamar, São Paulo, Brazil, in 2015 to meet the needs of the South American wind energy market. In our 75th year, Kaydon is celebrating the next stage of our history. In the words of A. Harold Frauenthal, "Our growth has been tied to our ability to look ahead, to anticipate needs, to improve manufacturing methods and develop new products," and now as part of SKF, the Kaydon brand will have a broader global reach to solve more of the world's most demanding bearing challenges for many years to come.